Get occasional news by email about our work. Buildings & Books library in Lukohe, Kenya. Buildings & Books envisions a world in which children no longer face a lifetime of poverty simply because they are denied access to books. Buildings & Books opened our fourth children's community library in April 2014 in the Kenyan community of Lukohe. Our newest library joins our libraries in Lwandeti, Dendyo, and Ndori in helping expand access to books for children in rural Kenya. There are nearly 30 million out-of-school children in Africa today. Those who do attend school often struggle to gain even the most basic skills, in part because books remain largely unavailable to them. Many classrooms lack even a single textbook, fewer than 1 in 5 students have access to a school or classroom library, and 70% of children have fewer than 10 books at home. Access to books – at school, at home, or in libraries – dramatically improves a child’s ability to learn, succeed in school, and ultimately earn higher wages throughout his or her lifetime. According to the World Bank, the provision of books is one of the most cost-effective ways to improve a child’s learning. 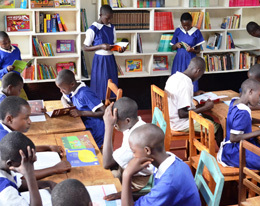 Libraries are particularly effective at expanding access to books in Africa, where the presence of a community library can double the number of books read by teenagers. Perhaps most striking is how inexpensive it is to get books into kids’ hands – community libraries in sub-Saharan Africa can increase reading by children for less than 75¢ per book read.